I started making computer graphics in the early 1990s when the Web was just coming online. When VRML came out in 1998, I moved from 2D webpages into 3D webworlds and I haven’t left since. I research and develop the informatics, graphics, and usability of Web3D. Before college, it was farming and then a bit of food service. But once I worked at the Computer Help Desk in college, I knew I had a knack for helping machines with people and people with machines. I took the amazing multi-disciplinary degree program in Cognitive Science from Vassar College. After some time in industry, I went back to school and completed my Ph.D. at Virginia Tech, specializing in visualization and Human Computer Interaction. In the late 1990’s (I think at VRML 1999) I met a mad man named Don Brutzman. He is a Professor at the Naval PostGraduate School. He enlisted me to help him bring the SIGGRAPH conference program and materials onto the Web. 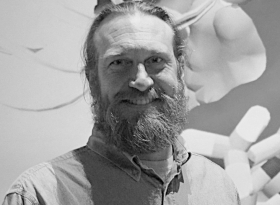 I joined the SIGGRAPH Online Committee in 2000 and 2001, where we organized a crew that recorded, processed, and published Web content (videos and slides) for the Conference. Given the technology of the time, it was a lot of work but good ideas have a tendency to stick around; now this important function is outsourced to professionals. Once upon a time, it seemed that the technologies of the Web and VR could really be a rising tide that lift all boats. Big companies were supporting and extending standards, communities were becoming more connected, and there was a real value proposition for end-users around the world. In the many rounds of techno-hubris suicide and Silicon Valley cycles, unfortunately, this seems to have changed: the companies now are much more closed and proprietary; the end-user is the value for the company rather than the other way around. In any case, once upon a time there was a premier, marquis SIGGRAPH event called The Web3D RoundUp. The interactive setup of the Web3D RoundUp event was very special: it is a live-demo event where each presenter has only a few minutes (3-5) to show and explain their Web3D technology or application. The audience was armed with noise makers and foam-shooters with which they expressed their enthusiasm or disdain. I remember one year we put it on in a big room in the LACC and it was packed… we still continue this exciting, live showcase tradition at the ACM SIGGRAPH Web3D Conferences. 1997: young punks start record label. Said punks build a multimedia 3D website and shopping experience based on the Pyramids of Egypt in 3500 BCE in HTML3, GIF, and VRML. This was before Linux, with no broadband, or GPUs at the time; the interactive Web3D experience was packed into less than 400 K of VRML models, textures and scripting… Last week, I opened the models in the Visionarium Lab at VT. Even though I have not touched the files in 20 years (since 1998), and even though the OS and software were entirely different, and even though the hardware is many generations more advanced (26.7 million stereo pixels at 30+ fps), the content ran perfectly; and faster than ever. From a magic carpet ride around the plateau to the bazaar of band merchandise to the deep passages of Transcendent audio connections, this early VR experience pushed the envelope of HANIM 1.1 characters, live music and news feeds into the cybernetic Mirror WWWorld. Since the punks’ noble effort, market forces have undermined creators’ and artists’ livelihood. But I still believe for consumer, producers, and enterprises, ‘Content is King’. Therefore, it is so important that artists and developers and enterprises have Web3D standards such as X3D and VRML to own their own data and their own future in the mixed reality ecosystem… well beyond Silicon Valley life cycles. Of course this question is hard, because I would rather have a dinner party… and if I had to pick one, it would depend on the day and my mood… but if you must go into bucket-list / desert-island territory, my last supper would certainly be with someone from the past whom I admire and aspire to learn from… Could be Babbage, Lovelace, Kant, Feynman, Gandhi, … the list of rich lessons is long and certainly longer than my time on earth could allow. we would multiply mental models … and wear them, like quantum wigs! When I am not coding, writing, or drawing, I spend my nights playing Musician… since 1996 I am in several regional bands as guitarist, singer, and banjo player; sometimes I even fill in as keyboard player or drummer. It’s a modest discography, but one I am proud of. Music (and multimodal improvisation in general) is a crucial exercise for my healthy balance of mind, body, spirit. But like graphics or any artistic medium, one must master the mechanics of the instrument so that the creative mind can really take flight … and find its manifestation. This is really a trick question. Of course the answer must be my wife of 23 years: Humility, Patience, Love and Service to others… leads to : Joy!. No. 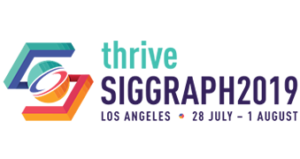 While I can partially blame someone specific (see Q 4 above), my answer here is really more about the culture and organization of SIGGRAPH in general. In the last 20 years that I have been working in ACM SIGGRAPH, nearly every person who I have worked with (from the Chairs to the staff to the volunteers) has been positive, creative, fun, and friendly. It makes a big difference when you can choose where to spend your time. I have been fortunate enough to work with brilliant scientists and designers over the years. It is really very rewarding when I can create a Web3D platform or visualization tool that can enable a new discovery or transform someone’s work (or their even their field). One of the first examples of such high-impact interdisciplinary work is with my colleague Prof Shuhai Xiao and his students. We used volume rendering and X3D to identify and characterize a unique species in the fossil record (from microCT of the fossil). This new species with tri-lateral symmetry provided evidence that revised paleobiologists’ theories about the Ediacaran period and its conditions [1,2]. Being the first person to see a shape hidden in rock for 355 million years is its own reward. There are a few more examples in this vein where my visualization work has directly increased scientific knowledge or real-life practice; for example, the lifecycle of the EBV Virus [3. 4], the gene expression and neural circuitry of the Zebrafish [5, 6], Architectural Education , and Urban Planning . I find these applications of computer graphics and their impact incredibly rewarding; its frankly the reason why I stay in this business! Mike Meyer, Nick Polys, Humza Yaqoob, Linda Hinnov, Shuhai Xiao (2017). “Beyond the stony veil: Reconstructing the Earth’s earliest large animal traces via computed tomography X-ray imaging”. Precambrian Research, Volume 298, Pages 341-350, ISSN 0301-9268, https://doi.org/10.1016/j.precamres.2017.05.010. Xiao, S., A. Muscente, L. Chen, C. Zhou, J. D. Schiffbauer, A. D. Wood, N. F. Polys and X. Yuan (2014). “The Weng’an biota and the Ediacaran radiation of multicellular eukaryotes.” National Science Review1 (4): 498-520. D.A. Thorley-Lawson, V. H., K. Luzuriaga, A.S. Jarrah, R. Laubenbacher, K. Lee, N.F. Polys, E. Delgado-Eckert, M. Shapiro, K.A. Duca (2007). “A Virtual Look at Epstein-Barr Virus Infection: Biological Interpretations.”PLOS Pathogens3(10): e137. Shapiro, M., K. A. Duca, K. Lee, E. Delgado-Eckert, A.S. Jarrah, R. Laubenbacher, N.F. Polys, V. Hadinoto, D. Thorley-Lawson, (2008). “A Virtual Look at Epstein-Barr Virus Infection: Simulation Mechanism.” Journal of Theoretical Biology252(4): 633-648. Marquart, G. D., Tabor, K. M., Horstick, E. J., Brown, M., Geoca, A. K., Polys, N. F., … & Burgess, H. A. (2017). “High precision registration between zebrafish brain atlases using symmetric diffeomorphic normalization”. GigaScience 6 (8). Setareh, M., Jones, B., Ma L., Bacim, F., Polys, N.(2015). “Application and Evaluation of Double-Layer Grid Spatial Structures for the Engineering Education of Architects”. Journal of Architectural Engineering21 (3).